I just whipped up a monstrous portion of Vitamin C filled organic strawberry “sorbet”, and I had to share it with you asap because it’s so stinkin easy you won’t believe it! Strawberries are a great source of Vitamin C, and this sorbet is filled with strawberries, so here ya go. Here’s the fastest, easiest sorbet you’ve ever made. Hope you have a good blender! 1 cup almond milk (may need a little more, test as you go). Almond milk is a fantastic source of calcium! You should be able to substitute other milks, but unsweetened vanilla almond milk gives it a great flavor with no added sugar, so it depends on “where you’re at” on the good/better/best scale. YOU decide. If you’re into it, go to www.WholeNewMom.com to look for her – almond milk recipe. Sweetener equal to 2 TBS pure maple syrup (grade B is the healthier one actually) or honey (we use local raw honey for health benefits). Liquid stevia or raw organic agave could be used as well. If anyone tries using an apple for the sweetener, let me know. Red or yellow, not green. Blend until smooth. Eat immediately! Melts fast. It will have the consistency of a milkshake, but we still used spoons to eat it. We topped it with chocolate chips since it’s a weekend treat, but they weren’t necessary. If you need to make this “to go”, like a smoothie, just add more milk, then pour it in a to-go cup with a straw. If you try this or another variation, let me know how it turns out! I can’t wait to hear about some of these creations. The possibilities are endless! 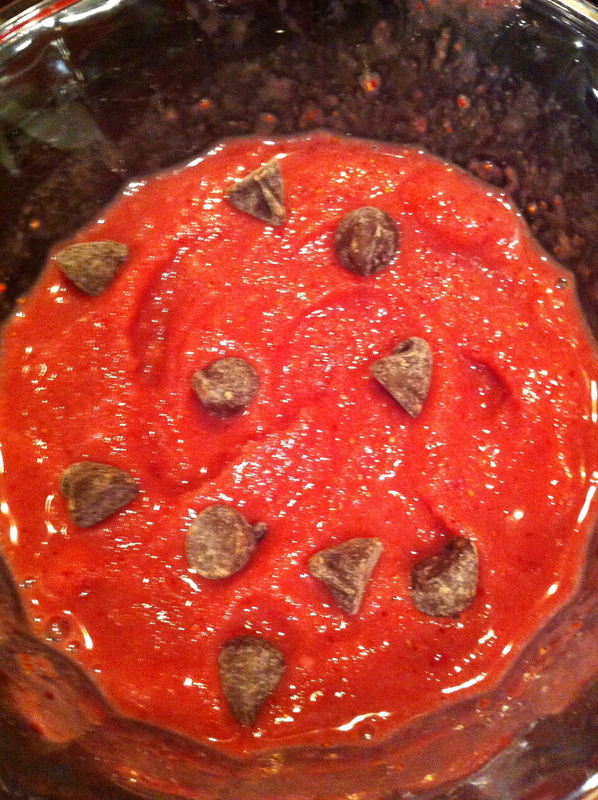 This entry was posted in Desserts, Recipes, Smoothies, Snacks & Bars and tagged almondmilk, Chew, Chocolate chip, dairy free sorbet, Garden strawberry, Health, Honey, low sugar, organic strawberries, Sorbet, strawberry sorbet by OrganicEater. Bookmark the permalink. WordPress had been pretty “easy” and self explanatory. I had NEVER created a blog before this one, and I think it turned out OK. Nothing fancy, but it works. 🙂 There is an amazing blog by Amy Lynn Andrews who tells you everything you need to know about blogging on WordPress. invaluable! So funny I am starting out sorbet recipes today. Glad I saw yours. Working on an Orange Sorbet for tonight – love orange sherbet so this is my healthy alternative. Thanks so sharing! It’s a great choice to add grade b maple syrup to this recipe. Almond milk seems like a wonderful addition, too. Readers, if you want to know more about the nutritional benefits of Grade B maple syrup, click on that link to find out more. Yes, Vinny, try it! :) we use it and coconut milk a lot around here! Vinny, would you mind telling me how you found this post? For some reason, I’ve had a lot more “first time” readers and comments from this post, so I’m really curious how you found me. Thanks so much!!! Vinny Grette, thanks so much for letting me know! Love your blog and your IG! Always great ideas! !